Project obstacles and solutions: The IndyGo Transit Center in downtown Indianapolis was designed to speed up bus service in the metro area. By providing a central location for switching buses, the 19 covered bays, ticketing and waiting areas were built to bring routine and efficiency to the only mass transit system in Indianapolis. Weddle Brothers served as the general contractor on this project. Ground was broken for the $20 million project in September 2014. All was moving along well until Weddle Brothers discovered they were building on history. In May 2015, the foundation of a building dating back to the early 1800s was found. Artifacts, such as pottery and glass items were unearthed. Construction was stopped as archeologists were brought in to excavate the site. This delayed the construction for seven months and added $5 million to the price of the building. When construction began again, there was considerable pressure to get the structure completed and operational as fast as possible. IMI supplied concrete for the foundation of the building, as well as walls, curbs, driveways and sidewalks. Special attention was given to concrete mixes and set times. To help keep the construction moving, IMI QC/QA designed a seven day paving mix with a high range water reducer that would gain early strength so the next construction step could begin. When ambient temperatures dropped near freezing, IMI QC/QA used a Type III cement in the mix to speed up curing. Type III cement is ground to a finer particle so it hydrates much quicker than regular Portland cement. Along with the speed of construction, there were some architectural components to the concrete used on this job. A micro-etch, exposed sand finish was used on walls, planters and walkways around the building. 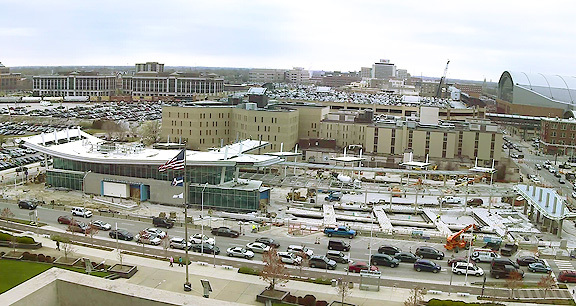 IMI supplied a total of 7,000 yards of concrete for the new Indygo Transit Center. The new transit center opened its doors for business in June 2016. For more information on paving concrete mixes, contact the sales representative for the plant nearest your location. Click here.